Over the course of the school year, I have been creating dividers for my interactive notebooks for my students. I adopted the divider that Sarah at Math=Love used in her classroom. At the beginning of the year, I would give my students 10-12 minutes to write their own Top Ten. We would then spend sometime reviewing these items as a class and trying to come up with our own top ten list. This mostly did not work with 7th and 8th graders because they are not able to pull out major topics and summarize it into short phrases. This still needs to be modeled for them. Instead of spending over 20 minutes on these t0p ten lists, I now spend about 13 minutes. My students struggled with completing unit projects because they did not have a specific list that had approved topics on it to work off of. 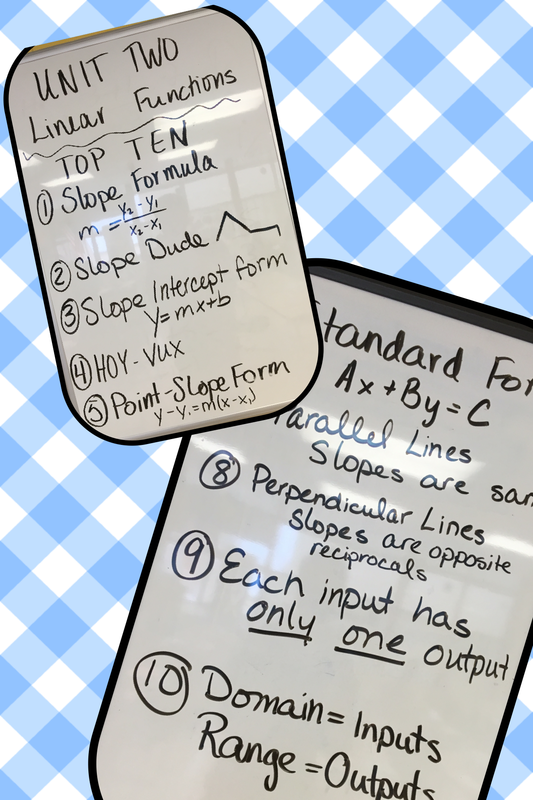 Now yesterday, we were completing our “Top Ten” in 7th grade math getting ready for our test on the “Ratios and Proportional Thinking” Unit. I was bored with life and looking for a way to engage a few more students. Let’s also be honest, my students were bored. I had written out my Top Ten list and knew what I wanted to be on the list when we finished. Instead of copying it over for the students, I ended up turning it into a little game show type of activity. (This just means I asked them questions and told them to “Come on down and get their prize.”) I gave students gold-tickets for correctly answering the questions and even when a student got something wrong, I wrote them a ticket and thanked them for reminding us that we are all learning. As much as I hate bribing students to do math work, this time it worked to my advantage. I had a lot more students engaged in answering the questions as I posed them. They were so excited when they knew the answer. Today when we took the assessment and a student had a question, I was able to tell them exactly who answered gave us that piece of information during our “Top Ten” review and many of them remembered. My coworker was in the room at the same time and she mentioned how much she loved that we did a “Top Ten”. She commented about how it made it easy for students to remember what would be on the assessment and review the essential information. I will definitely keep this practice around. I will even throw in the attempt to make it a bit more engaging using the Quiz Show type of review!! It’s Friday night, I just took a hot shower and I’m sitting on my couch watching some old episodes of ER eating some frozen potstickers for dinner (I didn’t feel like cooking!). I keep a bullet journal of things that I would like to/need to get done over the course of the day. Today, there was nothing crossed off. I had a list of things to do and despite the fact that I am sitting her exhausted, I accomplished nothing?! Create Trivia quiz for staff to complete during lunch. Grade 8th grade homework that needed to be returned today. – There was a lot and it had been backed up for two weeks. Review expectations during testing with 8th grade students. Collect all homework from this week from 8th graders. Troubleshoot student login issues for the online testing system. Supervise students in the hallway during passing time and in the middle of class (when they were causing enough of a distraction to interrupt my class). Assure 8th graders that weren’t done with their test that we would finish testing on Monday. Finish writing 7th grade assessment for the afternoon. Boost team moral through a mid-day run to Caribou Coffee. – Including my own personal sanity. Quickly grade 1/2 of the 7th grade homework that needed to be returned. Review expectations for 7th grade assessment. Graded the 2nd half of 7th grade homework to be returned. Avoided a complete class melt down when the rounding during the math problems caused questions to be marked wrong on the assessment. Managed 5th hour classroom behavior that was involved an insane amount of talking during assessments. Checked staff trivia question results. Emptied my turn in bins of everything that had been piling up there for a couple of weeks. – This was huge!! I had things waiting for my portfolio that had been there since before Winter Break. Put all my master copies into my master copy binder. And to think I was sitting here thinking I didn’t accomplish anything today! I hope your days felt more accomplished than mine did. As always, Live Long & Learn! I’m going to let you in on a little secret… Teachers HATE grading homework!! This post discusses the ways in which I have modified my homework collection practices (and a few teaching/grading practices). My cooperating teacher during my student teacher told me to make sure that I had a bin where students turned in their homework. This would eliminate students handing me homework or leaving it randomly on my desk. When I started teaching, I got one of those clear shoeboxes from target that I put on the corner of my desk and students would put their work in after we had corrected it. This little bin was pretty much the worst decision of my first year of teaching. I was stuck on the idea of correcting every single homework problem. I taught about 90 students that first year and each of them had about 15 homework problems a night an average of four nights a week. A little simple math tells me that I would correct approximately 6,000 problems every week. I HATED EVERY SECOND OF IT!! Yes, homework had a specific place to go and I didn’t have as many piles on my desk as I otherwise would. However, 6,000 problems every week (because when I read the answers out in class, students would just copy them) was INSANE! I also ended up with students papers mixed up all together. That meant that I would go from grading 6th grade work to 8th grade then a random late assignment from a 7th grader followed by a batch of papers from 6th grade. It was all over the place. In order to be semi-efficient, I had to sort all the papers first and then grade them. Then I had to deal with the nightmare of passing them back. Part way through the school year, I managed to scrape together enough funds on my teacher salary to get some nicer bins (because I had gone through 3 of the shoeboxes because students kept pushing it off my desk accidentally and it always managed to overflow before I could get through the work). These bins were awesome… one piece of paper fit exactly inside of the bin. I bought one bin for all 4 of my class periods, one for blank paper for students to show their work on, and one for graph paper. That means at any given time, there were 6 bins to put out for collecting papers. I made labels for each bin and taped them on the end to help students make sure that their papers were in the right bin. This at least tamed some of the chaos, but it was not the final answer. I still felt the need to correct every question and then give a score based on accuracy. I kept my separate bins for each class period I taught. Now I taught not only math but some variation of everything else. At some point during these two years, I taught pretty much every subject. (Even high school French for a short period!) Students still turned their work into the appropriate bin and then I would grade them. I gave up on grading every single question and instead graded for completeness and spot checked accuracy. Each assignment was now worth 10 points and pretty much everyone got a score between 5 and 10 if they turned the work in. However again because I didn’t have weighting figured out, students that turned in their work would still have higher grades regardless of how well they did on the tests and quizzes. I hated this because I was not assessing students and their content knowledge. Instead of spending time following up on student understanding, I was chasing them around asking them to turn in homework so that they could receive a passing grade. My administrator would sometimes insist that I change the students grades regardless of the amount of work that they completed. The bins that I had were getting pretty beat up and finding space for them in the classroom was a bit annoying. Enter the IKEA trofast unit! I found this on pinterest and I fell in love! Work was still a jumbled mess and it was a challenge to sort out each assignment prior to grading. I only had the shallow bins and they were green! Each drawer was labeled with one of my classes. Eventually I purchased a second one and then there was a bin for scratch paper and graph paper and whiteboards and anything else that I wanted! Work was still a jumbled mess and meant I had to sort out each bin prior to grading. I ended up handling every piece of paper a minimum of 2 times. My goal in homework was to handle it the fewest times possible. In terms of grading at this point, I made every homework assignment worth 5 points and I would have students grade 5 problems from different sections of the homework and then give themselves a score out of 5. This score was recorded in the grade book. This at least allowed me to gain a better understanding of the students abilities and helped to keep tests an important part of the grade conversation. I did run into problems when it came to assignments that had 20 questions on them and were only worth 5 points. Then there were assignments that had 5 questions and were worth 5 points. When asked by a concerned parent about this, I explained that the assignments with 20 questions were ‘easier’ and lower on the depth of knowledge scale than those with only 5 questions which were labeled as “critical thinking.” For the most part this system worked even though I struggled with the fact that students were merely ‘playing school’ instead of truly understanding the content. It was about whether or not they turned in the work and performed on the assessments. Students weren’t concerned about ensuring that they understood the content from math class. While I know that many places are moving away from assigning homework, I do believe that students should still have something to do at home. I want to put problems in front of my students similar to what they will see on the MCAs (Minnesota Comprehensive Assessment) when they take them in April. I want my students to be comfortable attempting problems even if they get them wrong. I want my students to struggle with understanding something and work on referencing back to the examples that are in the book or that are in their interactive notebooks. I want my students to work to make sense of the topics we review in class. Sometimes, my homework will be “explain your thinking on this problem we completed in class.” The most recent one that I was most excited for was “Create your own problem similar to these examples.” Homework has evolved from e assigning only the problems that were in the textbook to me asking students to create their own thinking about the problems. While none of these systems are perfect, they were what brought me to my current state. While I am currently satisfied with the way that I am managing the paperwork in my classroom, I am sure that at some point my style will change again. That’s part of the beauty of teaching. I get to be flexible and evolve. If you’ve made it to the end of this insanely long post, leave me a comment below! How do you collect homework? How have things changed since you started teaching? As always Live Long & Learn! Today was the first day of school. I was no where near ready for what I wanted my classroom to look like. I spent most of the two workshop weeks trying to get schedules and other random back to school items figured out. I tend to lend my assistance outside of my room and leave it for the end of the week. Regardless of whether or not I was ready, the students came! It was great to see the 8th grade students again and hear about the fantastic time they had during the summer break. One thing that I am very excited about this year is that I get to have an all 8th grade homeroom. I really hope that I can use this as an opportunity to build the 8th grade community and develop some leadership skills within the young men and women I spend my days. I believe that many classrooms begin the year by writing a social contract or a series of rules for the students to follow. Allowing the students to write the classroom expectations is a powerful activity that provides them with ownership over the learning environment. However, when done poorly this strategy provides little to no buy-in from the students. I’ve completed this activity in a variety of methods over the years that I have been teaching. I remember the first year being a big flop and subsequent years having it slowly improve. I was pleased with how this particular activity progressed this year. I gave each table a stack of quarter sheets of paper. Students responded to the prompt “What gets in the way of learning in the classroom?” on each paper. They wrote one thing on a sheet of paper then took another piece of paper and wrote another thing on that paper. They kept writing for about 8 minutes. I had students turn in these concerns and mixed them up. I then passed the concerns back out to tables. They read the set of concerns they received and attempted to write a rule/expectation to address the concern. They were asked to group concerns that matched up with each other. Once they had written rules to cover all of their concerns, tables shared with each other and combined their rules together from 8-10 rules back down to 4-5 rules. Students then shared their rules back out with the class. We recorded all of the rules on the board and combined them to create 4-5 expectations for our classroom. Students then nominated their peers to participate in a summit where all the homerooms will gather together to share their expectations and create a final set of expectations for the entire middle school. At the end of this process, we have a social contract that students and teachers are expected to follow. We create posters with these expectations and students sign off on the social contract agreeing to follow the expectations. We hang these in our classrooms and they stay there for the entire year. We also write these on the top of our Take A Break forms that students fill out when they have to use the buddy room. In preparing for school to start, I am planning to have my students complete the Numbers About Me activity that I’ve seen floating around the internet. I think I first found it at Everybody is a Genius and then I saw something similar on Math = Love. I once did a very watered down version of the activity that was essentially a template/worksheet. That version was not as successful as I had hoped. I ended up with generic answers to questions and random drawings (mostly multicolored scribbles). It’s a new year so a new opportunity for me to try something new. I made a presentation about numbers about Ms. Schley. I used it as a quiz of sorts. We then practiced names while students guessed the answers. I would tell them higher or lower and other students would guess. Once we had guessed the correct number, I used it as an opportunity to tell them a little bit about myself. Even the 8th graders that I had last year enjoyed guessing and remained engaged in the activity. Once we had talked about the numbers about me, I gave the students the assignment of creating numbers about them. They will then use these numbers to decorate the outside of their interactive notebooks. This activity will probably take place at the end of the week so look for an update then. While at Twitter Math Camp this summer, I learned that Desmos launched a new card sort feature on the teacher.desmos.com site. I love Desmos! If you have ever heard Sara Vanderwerf talk about Desmos, you will also love Desmos! Check out her blog at saravanderwerf.com. I took this card sort activity idea back to my school and my mentor thought that it would be awesome for all of the teachers to see and experience. I thought that I would write a blog post to show them how to create their own card sorts. First, go to the teacher.desmos.com site. We need to make sure that you have a Desmos account. Choose Create an account from the upper right corner. You will then either need to create an account or log in with your google account. If you do not use google, choose a user name and password and enter your email address. Once you are in, you will need to make sure that your account has access to the card sort activities. In the upper right corner, click on your name and choose Desmos Labs. Now it’s time to start making our first card sort. On the left side of the screen under ‘Your Activities’ you want to choose custom. Then in the upper right corner choose New Activity. You will end up at a screen like this one. From here choose Labs and then choose Card Sort. You are now ready to create your card sort. To help expedite this posting, I have created a video of me actually creating my card sort so that you can follow along. After you create each of your cards, you will need to make sure that you add an answer key for each card sort you create. You can see the “Add an answer key” button in blue. Once you create it, you click the done button in the upper right corner. Once students are in, it’s pretty simple to follow along. If you have any questions, feel free to leave a comment below or get it touch with the people at Desmos. They are awesome at answering questions! !